I may have mentioned a time or twenty that I love Fall. One of our new favorite snacks can be made year round, but feels a little fall-ish too. The kids made these for the Barn Sale. We use the huge campfire marshmallows. Put a wooden popsicle stick in the end. I think it's easiest to "paint" it with chocolate using the back of a spoon, rather than dip it. Then over a bowl, sprinkle on crushed graham crackers. Or colored sprinkles. Or my favorite, Heath bar bits. Oh yes! Toffee S'more Pops! And if you're a chocolate snob like me, you'll use Ghirardelli dark chocolate. Your life will never be the same. Now just because you look so lovely today, we're offering a giveaway. 2 people will win a $25 gift certificate to The Rusted Chain! 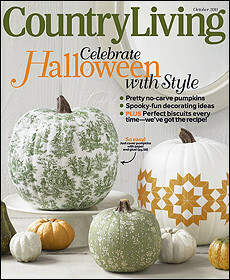 Those two people will also receive a subscription to one of our favorite magazines, Country Living! To enter: simply leave a comment telling your favorite Fall treat. We'll pull 2 random winners in a few days. My favorite fall treat is apples dipped in carmel sauce, it's delicious! My favorite fall treat is very simple...Pumpkin Muffins. You mix a spice cake mix (just the mix, not the eggs or oil as directed on the box) and a can of pumpkin. You mix them together and bake in muffin cups . They are super easy and delicious! I love anything pumpkin....coffee, scones, bread, candles, you name it. If its pumpkin, I am in! :) Thanks for such a generous giveaway. My favorite fall treat is s'mores made over a bon-fire. I love your s'more pop idea though. We will have to try that. Thanks for sharing. My favorite fall treat is candy corn!! Once I see this in stores I know fall is just around the corner. This is my favorite time of year! I love Fall...and Fall treats! Pumpkin cheesecake, a pumpkin latte, carmel apples, YUM! Sweet potato souffle. It's like sweet potato casserole -- only better! Pumpkin,Pumpkin,Pumpkin! Did I mention pumpkin? My favorite fall treat is hot apple cider. My mom used to make it all the time and every time I smell it warming on the stove I think of her. My favorite thing about fall is caramel apples. Favorite Fall Treat- pumpkin pie and hot chocolate!! I pinned those s'more pops! And I shared this giveaway on Twitter! Thanks! My favorite fall treat is apple crisp and hot apple cider. Pumpkin cheesecake and apple cider. Yum! Pumpkin Pie.....who cannot get behind a pumpkin pie...it is one of the best foods ever. My favorite fall treat is probably pumpkin bread. The other day, my DD asked me why we only bake this in the fall. I didn't have an answer for her. Somehow, we forget about it in the spring and summer as different "favorite treats" come into season. As soon as school starts, though, I start thinking about more baking... and pumpkin bread. We love it! I just left a link on my facebook page. Thanks for such a great giveaway! lately I am loving hot chocolate with pumpkin spice mallows....so very good and comforting, even though we haven't had Fall here yet! I pinned your jewelry and a s'more pop. I love caramel apple dip. YUM! My favorite yummy fall treat is Candy Corn. I saw the S'more Pops at the barn sale and they looked SO yummy! I may have to make some soon! My favorite fall treat is a pumpkin whoopie pie (also called Pilgrim Pies.) They are SO yummy! Giveaway shared with all my Facebook friends. My favorite this time of year is cranberry apple crisp...dee-lish! :) Oh, and caramel apple cider! I posted to FB, too! My fav fall treat is a pumpkin crunch cake! But, chocolate is good in the fall and the winter and the spring and the summer too! 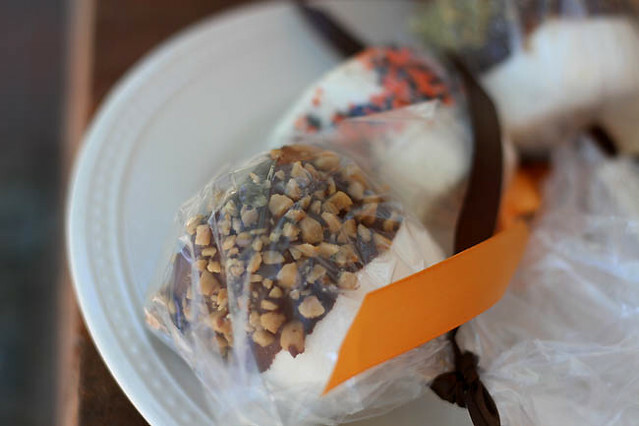 Pumpkin muffins are my favorite fall treat, but your s'more pops are a definite must try! One of my favorites is apple pie........... with a good cup of coffee.......... and I really want your "blessed" necklace ;-) And some of those marshmallow pops......! I love my mom's spiced tea and pumpkin rolls! Yummy! My favorite fall treat is apple cider doughnuts & hot spiced apple cider. I also shared on Facebook! Thanks! I pinned the necklace picture (andi trautman) - love the worship always necklace. Just about ANYTHING with pumpkin in it! I love Chocolate Chip Pumpkin Muffins and Pumpkin Milkshakes! Anything with pumpkin in it - cookies, bread, pie, bars. Though found a new version of something pumpkin last weekend - at DQ - Pumpkin pie blizzard! Oh my! Thanks for the generous give away. It must be fall!! I see lots of pumpkin treats as a favorite fall treat. I am in that same group, pumpkin cookies with cream cheese frosting...ymmm! carmel apples and warm kettlecorn popcorn...oooh and apple cider, in small amounts. Caramel Apples!!!! MMmmmmm! Thanks for the chance! Well, this is funny because I'm doing a giveaway on my blog and I asked the same question. So, its obviously a good question. And my answer would be apple pie or pumpkin dump cake. MMMMMMM! My favorite fall treat is ... Hm, probably my moms sweet potato casserole. She like crams TONS of sugar, plus marshmallows, in with the sweet potatoes and it's really good ;). My favorite fall treat is caramel apples! My favorite fall treat is dressing with cranberry sauce. It just doesn't seem right to eat this except around the holidays! My favorite fall treat is caramel apples- hands down! But, those smores pops are looking quite tasty! My favorite fall treat is apple crisp ...warm...with vanilla bean ice cream. I love to have hot apple cider and apple pie. Smells and tastes delih. Soup! Any kind of soup! Wow, really just one. Alright, I will narrow it down to just one. I love anything with pumpkin. That's a broad statement...pumpkin pie, pumpkin muffins, pumpkin spice latte...this list could go on and on and on. My favorite fall treat is anything from Taste of Newton! I love my nutella hot chocolate! Boiled milk and nutella, yummo! I pinned the s'more pops, and the jewelry. Hot apple and orange cakes and biscuits... yum! i LOVE starbuck's pumpkin spice latte! One of my favorite fall treats is homemade Chex mix. Another is a candy bowl filled with crack...er...candy corn and dry roasted peanuts. I'm more of a summer s'mores gal, but honestly,if you shoved on at me, beside a lovely bonfire...I wouldn't fight it. Hot apple crisp with vanilla ice cream! 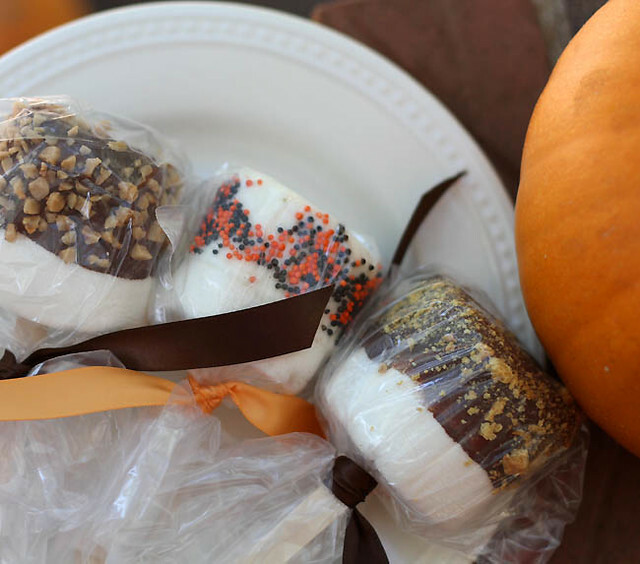 My favorite fall treat is either caramel dipped apples or pumpkin spice cake! Thanks for the chance to win! I pinned your smores pops! For sure it's pumpkin spice latte! Hot apple dumplings with vanilla ice cream!!! Favorite treat has to be apple crisp! Love Caramel Apples with pecans! 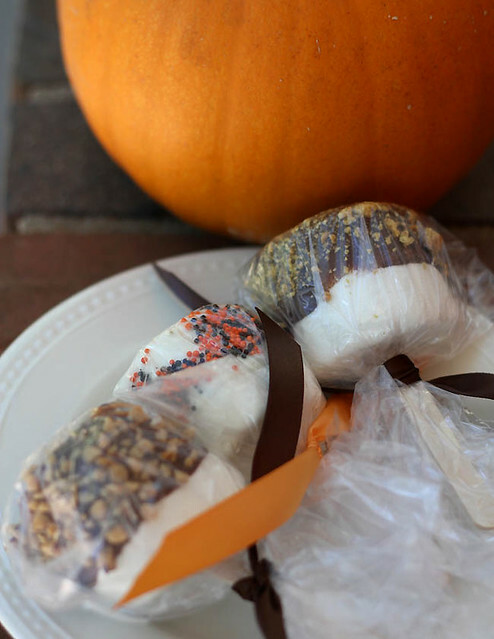 Favorite fall treat? Pumpkin pie with a HUGE dallip of cool whip!!! Yum!!!!! My favorite fall treat is hot chocolate loaded with a ton of mini marshmallows, yum!!! My favorite fall treat is anything pumpkin! Lattes, pie, cakes, cookies, oatmeal, you name it! Hmm...just one favorite fall treat? Well, it would have to be French apple pie. Not a double-crusted apple pie, but one with a brown sugar/cinnamon/butter mix on top instead of a crust. I pinned the second picture on Pinterest. My favorite fall treat is Thanksgiving Pumpkin Crunch, and pumpkin roll. And now I have to add your smores to that list!!! A toss up between pumpkin pie milkshakes and starbuck's pumpkin spice latte! My favorite fall treat is pumpkin pie and a close second is candy corn mixed with peanuts! I love pumpkin spice lattes! Anything involving pumpkin and cream cheese. Love my SIL's pumpkin roll every year at Thanksgiving. Caramel Apples and Chocolate Chip Pumpkin Cookies. Delish! pumpkin cheesecake...followed closely by hot chocolate, the real stuff like mom made us. The pumpkin-shaped candy corn! Yum!!! Hmmm. Tough one. I love anything pumpkin-y. But I think I'm gonna have to go with chai tea. Does chai qualify as a treat? Oh, man now I must go find my recipe and make some. Hot pumpkin pie with cool whip, and pumpkin cookies with chocolate chips. They're both great. My favorite fall treat are these Pumpkin icing cookies we make every year! They are so yummy! My favorite fall treat is cream apple pie. My great-grandmother's recipe! My favorite fall treat would have to be apple cider! Love, love, love your jewellery. Almost as much as PUMPKIN (mmmmm, pie). When I think of fall, I immediately think of Thanksgiving and the sweet potato casserole. mmmm is it Nov yet? Thanks for sharing your creations! Caramel apples, apple pie, and almost anything pumpkin. My hometown had a great family candymaking business and they always sold amazing caramel apples at football games in the fall - I sure wish I had one of those caramel apples now, yum! I love toffee apple dip with apples. YUM! pinned those yummy looking pops for future reference, thanks for sharing. My favorite fall treat is candy corn! I do love s'mores!! Your's look delicious! I love to cook Apple Crumble. We make a pumpkin dip and use gingersnaps to eat it. Sooo good! I need to look up the recipe and make it again!! 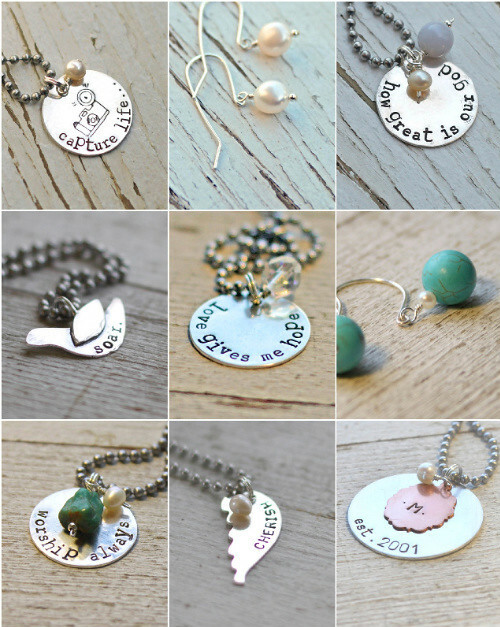 What lovely jewelry! My favorite fall treat is apple crisp with ice cream! Yum! Or anything pumpkin . . . I'm a bit of an addict. anything that someone wants to make for me. :) i'm easy to please. Love candy corns and also love anything apple!! I absolutely love apple crisp, heavy on the crisp! Hot chocolate. It snowed Wednesday and I had hot chocolate, my 1st of the year. Hand picked apples dipped in carmel! Thanks for a fun giveaway! I love my son's birthday! Um, honestly, I love candy corn. Should I hang my head in shame now? I simply love the fact that it's cool enough in the mornings to enjoy a hot latte or mocha! My favorite treat, for sure.